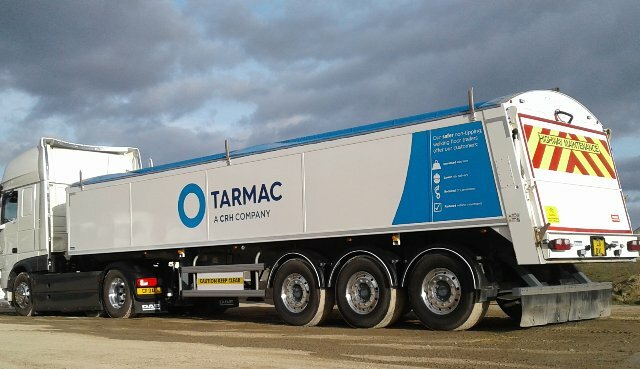 On a recent scheme we worked with our supply chain to make wider use of ‘walking floor trailers’ instead of traditional rigid tipper trucks, for the delivery of materials to site improving safety for the workforce. The project work is carried out generally under overnight closures on the motorway and trunk road network when traffic flows are lower. This includes the necessity to work in close proximity to overhead structures including bridges, sign gantries, overhead BT cables and overhead electric power cables. Whilst control measures are in place to manage the risk to these from tipping operations (e.g. when loading the paving machine with asphalt material from a traditional tipper truck) we were keen to explore options further which removed the human risk factors. We thus expanded the use of ‘walking floor trailers’ on the project to avoid the need for tipping. This brings multiple benefits to site operations including improved environmental performance through reduced total lorry movements (as the walking floor vehicles have a larger capacity); improved safety around overhead obstructions through no requirement to tip the body of the truck; and increased productivity due to a larger carrying capacity and continuous laying. On a recent scheme on the A63 for example, use of the ‘walking floor trailers’ allowed us to reduce truck journey miles (plant to site) by around 7,900 miles over a weekend. That’s nearly the same distance as driving from London to Johannesburg, the largest city in South Africa.